Wall Street expects flat profit and lower sales, but that's only part of the story. Consumer goods giant Procter & Gamble (NYSE:PG) will post its second-quarter results before the market opens on Tuesday, Jan. 27. And after getting its fiscal year 2015 off to a slow start last quarter, Wall Street isn't looking for much in the way of top line or bottom line improvement. In fact, earnings are expected to be flat while revenue falls hard from the prior year total. Q2 2015 Wall Street Forecast. Source: Yahoo! Finance. However, revenue and EPS figures aren't particularly useful as they include huge currency swings from P&G's international markets. Here are three more important things for investors to watch for in next week's announcement. Organic sales growth strips out those foreign exchange fluctuations, making it the single best number by which to gauge P&G's business. 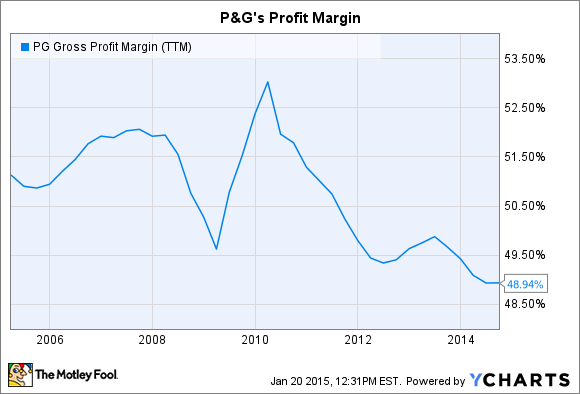 That figure has been weak lately, at just 2% in each of the prior two quarters and 3% for P&G's last full fiscal year. By comparison, P&G booked 4% organic sales growth in fiscal year 2011. Recent growth is half that pace and consistent with what management has been describing as a "challenging" global selling environment. Still, it's possible that an uptick in demand in the U.S. will boost overall sales this quarter. Lower unemployment, higher wages, and lower gas prices might have combined to give consumer spending a lift in the second quarter, powering a rebound in sales growth. And if that happened, investors could see P&G raise its full year organic growth outlook above the "low to mid single digit range" that is its current target. Meanwhile, P&G is on a mission to sell or spin off dozens of its brands so that management can focus on the most profitable, fastest growing products in the portfolio. The company will slim down to just about 75 core brands by the end of 2016. That process has already brought major changes, including the Iams and Duracell sales last year. P&G will likely have more announcements on the brand shedding strategy next week. If you believe CEO A.G. Lafley and his executive team, then the payoff from these spinoffs will be a faster growing, more profitable P&G over time. It would be too early to expect strong evidence of that rebound next week, but investors are hoping to eventually see a gross profit margin that is expanding again for the first time since 2010. But one figure that's almost sure to improve this quarter is cash flow. Operating cash growth in the first quarter notched its best performance in five years. The company generated $3.6 billion -- 78% above the prior year -- thanks to improvements on collecting payables and on managing the supply chain. That result gave management the ammunition it needed to deliver huge returns to shareholders in the form of spending on dividends and share repurchases, which totaled $4.2 billion in the first quarter alone. P&G plans to direct more than $7 billion back to investors over the year, which shows just how big a role cash plays in the total return that shareholders can expect by owning a piece of this consumer goods giant.